During the night of day 1, we knew the overwhelming results of Apple's income and profits during the first calendar quarter of 2018 , which corresponds to the second fiscal year. In them there was an absolute winner, the star product of the bitten apple that managed to continue growing globally as in all markets. We are talking about the iPhone X. 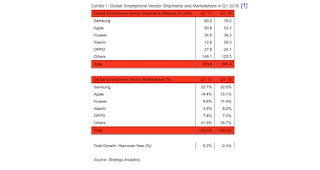 However, to further recognize the merit of the reference phone of the last year, the consultants IDC and Strategy Analytics have conducted a study analyzing the global smartphone market during the first three months of 2018. According to them, the number of terminals sold amounts to 345 million . According to the numbers of Apple, the growth of units sold was of only 3% , but where ** truly Apple noticed the imprint of the iPhone X was in the income **. And the unit price of the iPhone X is much higher than the iPhone 7 the previous year. The figures made public by Apple on day 1 referred to 52.2 million iPhones sold in the last three months, which according to the consultants constitute approximately 15.5% of the global market share , with a slight growth compared to the 14.7% of the same period in the previous year. 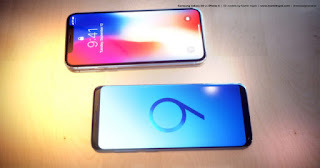 You have to take into account several factors before reading your table : that the stock of the iPhone X is already regular, that the Christmas period has ended or the launch of the Samsung Galaxy S9 and S9 + in March. In this table you can deduce several things. For starters, the emerging Chinese brands continue to grow brightly with Xiaomi and Huawei in the lead with 78% and 13.8% respectively over the previous year. The same does not happen with OPPO, which loses 7.5% market share. And it is one thing to succeed and another to stay . We will have to see how Xiaomi is transformed from a low cost firm into a reference brand in innovation , something of its own considering its numbers. Beyond the new signatures with interesting proposals whose designs suspiciously resemble those of Apple or Samsung, are the two classic firms of the last decade: Apple and Samsung . Bad news for Samsung , who sees that not even get away in time from Apple's keynote manage to impact the consumer. And the launch of the Samsung Galaxy S9 - a model that is a mere update of the successful S8 - manages to increase sales. Of course, Samsung is still the absolute leader of the smartphone sector , something logical and normal given the differential strategy of the Koreans, who launch several models a year of low, medium and high range. Thus, Samsung goes from exceeding the 80 million terminals sold in the quarter to 78 million. Apple does not differentiate iPhone models and their respective market shares, but keep in mind that by releasing less variety, the bitten apple continues to grow in both units sold and profits . And if Apple detailed on Tuesday that the average price was $ 728 per phone sold, is that the iPhone X sells a lot.